In this masterful performance of ‘otherness,’ Tawada pushes us to feel the humming possibility between how things appear and what they could be. Memoirs of a Polar Bear works on many levels, fizzing with ideas on exile, migration and love… questioning what it means to be human. Memoirs of a Polar Bear is a hauntingly strange concoction of dreamlike fantasy and factual­-based reality. A Kafkaesque exploration of the permeability between the human and the non-human, the self and the other, Yoko Tawada’s enchanting novel also addresses the timely issues of migration, citizenship and climate change. Playfully direct, dream-like, family saga-with-a-difference. Tawada’s subtle polemic is sympathetic not hectoring, but her point is clear. Yoko Tawada’s whimsical ursine family saga expresses a powerful sense of justice. It may be that Tawada is exploring love at its most devouring, manipulative and dominating. It is a book which begins as a delightful role reversal rich in physical sensation and whimsy, yet the intense emotion and powerful sense of justice suggest that Yoko Tawada believes that engagement is the most effective method of communicating the distorted mirror through which we look at the world. Yoko Tawada opens a space of human-polar bear empathy & solidarity—amusing yet deeply serious. Tawada masterfully transports the reader to this place approaching transcendence, where language — so distinctly human, we suppose — brings us into imaginative intimacy with another kind of being. Disconcerting and exhilaratingly strange. With a deft wave of her literary wand, Tawada dissolves the frontier between humans and animals, disorientating us so that we can be more properly oriented towards ourselves. For all the wonderful workings of plot and structure in Memoirs of a Polar Bear, what is truly affecting is Tawada’s writing, which jumps off the page and practically sings. Tawada asks us to see writing from an unusual perspective: it is like balancing on a ball, or hunting. Thus we’re forced to see writing not just as a cerebral art but a physical one, as well. 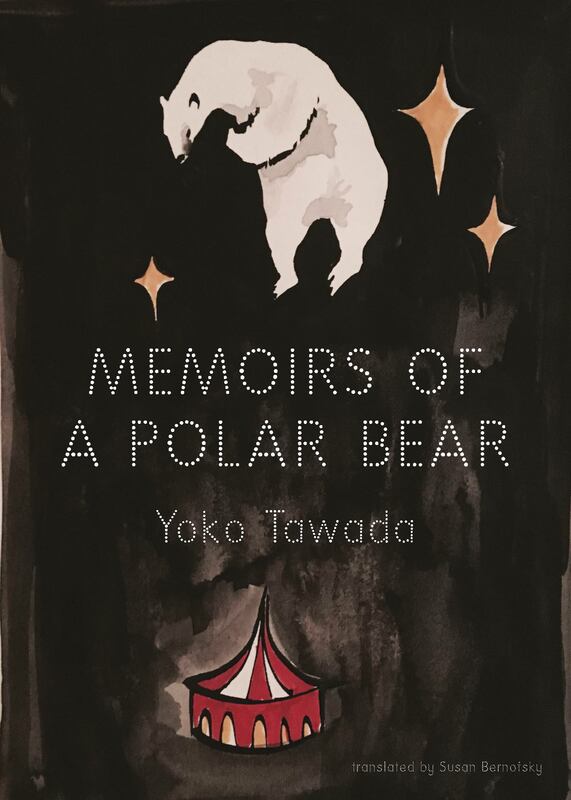 The novel’s eldest bear describes writing as a ‘dangerous acrobatic stunt.’ In Memoirs of a Polar Bear, Tawada executes this stunt with the effortless grace of a seasoned circus performer. This novel is ‘doubly translated’ in the sense that Yoko Tawada first wrote it in Japanese and then translated it herself into German, from whence it was recrafted into English. It even boasts an additional layer of translating, as it were, since the first part of the book is narrated by a Russian-speaking bear. The story itself follows three generations of polar bears across the world in a powerful tale of both family and isolation. Ms. Tawada brings her fine-nosed, soft-furred beasts credibly to life… [Tawada] has a deadpan wit and disorienting mischief all her own, nimbly translated from the German by Susan Bernofsky. Tawada bears out the truth that tongues can also bring inventive thoughts to vibrant life. Both a novel of ideas and Knut fan fiction, Memoirs of a Polar Bear is as densely philosophical as it is deliciously absurd, and as playful as it is poignant….To read it is to become polar bear, without being permitted release from the limitations of our humanness. Writing, for Tawada, is solace—the only way for us to do what the bears in this story do naturally is to pull together the pieces and express something innate we didn’t know we had language for. Memoirs’ great triumph is to literalize this process, to replace a metaphysical problem of expression with concrete representation. Memoirs gives us an often funny and intimate perspective on what it must be like to be a sentient bear in an overwhelmingly human world. In ‘Memoirs,’ when a polar bear walks into a bookstore or a grocery store, there are no troubles stemming from a lack of opposable thumbs. As with Kafka’s animal characters, we are freed to dislike them in the special way we usually reserve only for ourselves. This utterly brilliant and absolutely delightful novel by Japanese-born Yoko Tawada, written in German, is by far the freshest take I’ve read on both foreignness and writing in I don’t even know how long–possibly ever. As acrobatic with her writing as her polar bear subjects, Yoko Tawada walks a line between fantastical yet believable. But like those of Bridegroom, the animal characters of Memoirs pursue a hybrid existence, refusing to romanticize the state of nature. In chronicling the lives of three generations of uniquely talented polar bears, the fantastically gifted Yoko Tawada has created an unforgettable meditation on celebrity, art, incarceration, and the nature of consciousness. Tawada is, far and away, one of my favorite writers working today—thrilling, discomfiting, uncannily beautiful, like no one you have ever read before. Memoirs of a Polar Bear is Tawada at her best: humanity, as seen through the eyes of these bears, has never looked quite so stirringly strange. Her penetrating irony and deadpan surrealism fray our notions of home and combine to deliver another offbeat tale. An absorbing work from a fascinating mind. Her finest stories dramatize the fate of the individual in a mobilized world. A distinguished contribution to the unique paranoid style of the new European novel. Tawada’s accounts of alienation achieve a remarkable potency. Tawada’s stories agitate the mind like songs half remembered or treasure boxes whose keys are locked within. A writer of scrupulous intensity.